Brevard Zoo is a 75 acres (30 ha) not-for-profit facility located in Melbourne, Florida, United States that is home to more than 900 animals representing more than 195 species from Florida, South America, Africa, Asia, and Australia. The zoo features animal feedings, kayak tours, paddle boats in the wetlands, behind-the-scenes tours, and a train ride. It also has the attraction Treetop Trek. The zoo has also featured a dinosaur exhibit several times in its past; its most recent exhibit "Dinosaurs are Back" ran from November 2017 to April 2018. Brevard Zoo is a not-for-profit organization accredited by the Association of Zoos and Aquariums. The zoo is divided into four loops: Expedition Africa, Lands of Change: Australia and Beyond, Wild Florida, and La Selva. These loops are accessed off of the main loop that encircles the flamingo pond. In 1986, the East Coast Zoological Society of Florida, Inc. (ECZS) formed, one of their goals was to build a zoo for Brevard County. In 1992, building of the zoo began, over 16,000 people came together to help build the zoo. The Brevard Zoo claims to have had "The World's Largest Volunteer Community Build." 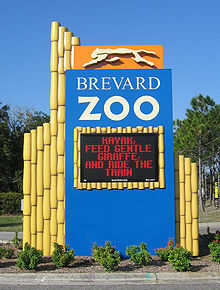 The Brevard Zoo celebrated its grand opening on March 26, 1994. A record 328,973 visitors attended in 2007. This included 175,046 paid daily guests. The others included reciprocal members of other zoos, and annual members. The zoo has an annual budget of $5 million most of which is earned and not raised through fundraising or grants. In October 2012, one of the southern white rhinos from this zoo was transferred to Alabama's Birmingham Zoo to take part in a breeding program with its two female southern white rhinos. In 2014, the black-throated monitor died. It was donated to the zoo when it was two years old in 2005. In 2017, the zoo renovated their Australia and Asia exhibits and reopened them as "Lands of Change: Australia and Beyond." The Wildlife Detective Training Academy, or WDTA, is a building focused specifically towards younger children and features terrariums containing many of the zoo's reptiles, amphibians, arthropods, and at least one mammal, a naked mole rat. It also features interactive activities, such as a sand pit, where children can dig up bones from an animal "crime scene", and an animal hospital where children can learn about animal anatomy and veterinary science. The WDTA also features a new mystery every month in which children can investigate and find clues throughout the zoo. The building is located to the right of the main entrance in a separate building. After Paws On reopened in 2009, visitors now have to go through Paws On to enter the WDTA. Expedition Africa offers kayaking on the grounds of the zoo. Trained staff lead the kayak trips and provide informative dialogue during a slow glide past African-themed exhibits. These exhibits include: giraffes, a blue crane, white rhinos, and ostriches. After kayaking, visitors can climb up to an observation platform where the giraffes feed at eye-level. Siamang gibbons are located in-between the entrances to the Africa and Australia/Asia Loops. Cheetahs were added in February 2010. meerkats were added in 2014. Two Grevy's zebra mares were added to the white rhino exhibit on President's Day 2015. The zoo also has a population of scimitar oryx, a species of oryx that has been extinct in the wild since 2000. On February 3, 2017, a new oryx calf was born at the zoo. As its name implies, this loop features animals from Australia and Oceania. Visitors can find animals such as the red kangaroo, emu, and wallaby. Lands of Change: Australia and Beyond also hosts the free-flight aviary where visitors have the option of feeding rainbow lorikeets. The aviary is home to: galahs, lorikeets, cockatiels, kookaburras, and shelducks, among others. It is divided into three sections - the "bat side" with fruit bats, the main exhibit with the lorikeets, and the turaco side with several species of turacos. The turaco side of the aviary is also where the butterfly exhibit is put up during its brief stay at the zoo of about six weeks each year. Siamang gibbons are located in-between the entrances to the Africa and Lands of Change: Australia and Beyond. River otters, alligators, crocodiles, and bobcats are just some of the animals on exhibit. This loop also contains a pack of the nearly extinct red wolf. Feeding is demonstrated in this loop. There is an area to pedal boat into a wetland environment. La Selva houses the zoo's jaguars, cotton-top tamarins, and golden-headed lion tamarins. This loop also feature's green iguanas, a Baird's tapir, a family of capybara, and a Hoffmann's two-toed sloth. In March 2007, a newly constructed vulture exhibit opened, which houses king vultures, turkey vultures, and black vultures. Vulture feedings and demonstrations are offered to visitors much the same way they are conducted within the Wild Florida loop. Paws On once provided a place for children to play in a playground, and a petting zoo for children to explore. The Contact Yard (petting zoo) had goats, chickens, a fallow deer, a miniature horse, and a miniature donkey. It was closed for renovations in 2007. It reopened in April 2009 and now contains an updated Contact Yard, a shallow swimming area, an aquarium mimicking the underwater environment of the nearby Indian River Lagoon with animals such as Tarpons, stingrays, and black drums; a touch tank with horseshoe crabs, hermit crabs, and Florida crown conchs; a pizzeria, and various other attractions aimed towards children of all ages. Animals from the old Paws On that were kept include the Soil Cube and the Whale Slide. The Contact Yard now contains alpacas, pygmy goats, an African spurred tortoise, and armadillos. Other animals include a barred owl and a great horned owl, Florida box turtle, and a gopher tortoise. The zoo received 363,426 visitors in 2011, up 5% from the previous year. This represented the second highest number of visitors on record. Visayan warty pig piglet in Australia/Asia. ^ "Currently Accredited Zoos and Aquariums". aza.org. AZA. Retrieved 19 February 2011. ^ "About The Zoo" (PDF). www.Brevardzoo.org. Retrieved 27 June 2018. ^ "Dinosaurs Return to the Brevard Zoo". www.vieravoice.com. Retrieved 27 June 2018. ^ "Brevard Zoos Newest Exhibit Lands of Change Australia and Beyond Set to Open May 27/". www.SpaceCoastDaily.com. Retrieved 27 June 2018. ^ "About The Zoo". www.Brevardzoo.org. Retrieved 31 March 2013. ^ Balancia, Donna (January 15, 2008). Brevard had more visitors in 2007. Florida Today. ^ "AECC & Brevard Zoo Say Goodbye to Black-Throated Monitor Lizard". Animal Emergency & Critical Care Center. ^ a b Business Briefs, "Brevard Zoo Attendance Up in 2011", SpaceCoast Business magazine, vol. 7, no. 1 (Melbourne, FL: April 2012), pg. 21. This page was last edited on 28 December 2018, at 01:21 (UTC).